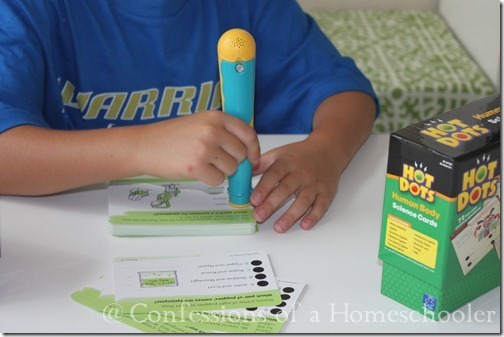 Educational Insights Hot Dots Giveaway! Hi everyone! I have an awesome giveaway for you all today! 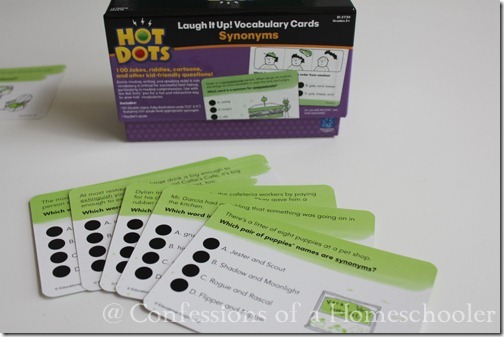 Educational Insights has come up with some new Hot Dot cards and a fun new pen as well. And today I have some of them to giveaway to you all! Since we’re working on the human body this year, I chose the Human Body Science Cards. What a fun way of reviewing and practicing all of the parts and functions of the Human Body! For those of you who haven’t heard of Hot Dots before, they are educational cards with dots on them. When pressed on the dots, the special pen registers whether or not the answer is correct or not. 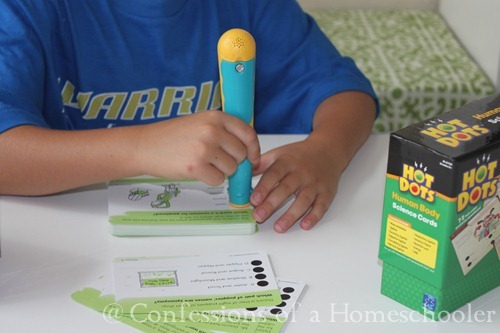 The pen then lights up green and dings for a correct answer, or red and buzzes for an incorrect answer. We also chose some Vocabulary Cards, these particular ones help practice Synonyms. Here is a close up of what some of the cards look like. This set comes with 50 double-sided, illustrated cards that cover synonyms for grades 2+. They have 6 interactive vocabulary card sets which include antonyms, multiple-meaning words, prefixes and suffixes, context clues, and homophones. Want more info? Visit the Educational Insights links below, if you stop by let them know that Erica @ Confessions sent you over! Educational Insights is offering 1 FREE Pen and Card Set of your choice to one of my readers! Simply leave a comment below letting me know which set of hot dot cards you’d like to win from Educational Insights! Like Educational Insights on Facebook, then come back and leave a comment letting me know you did! 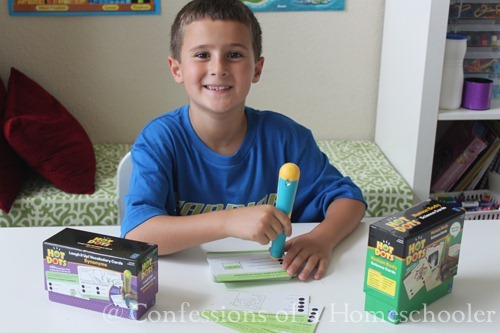 Enter to win a free hot dot set from @ed_insights and @ericahomeschool! Enter thru 8/3/11! The give away will be open until midnight EST Friday August 3, 2012. Winner will be announced by Sunday August 5, 2012. If prize winner forfeits or does not claim the prize, prize will be re-awarded at my sole discretion. This giveaway is offered to US and Canada residents only! Odds of winning based on number of entries. Disclosure: Educational Insights provided me with a free copy of their product to review on my blog. The opinions I have given are mine and may differ from others but were not influenced by the company or the free product provided. I LOVE this idea and had not heard of Hot Dots before. I would love the Human Body Hot Dots, because we are currently working on learning about the human body over the summer and through school next year. I have been wanting to try these. I would probably get any of the reading ones or math ones. 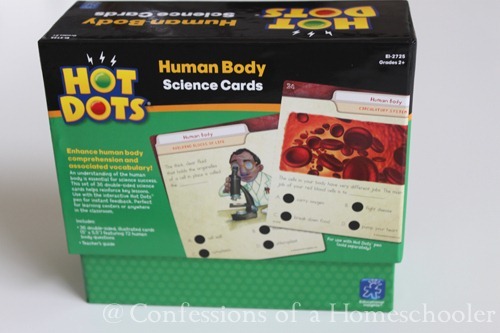 I would love to have a set of the Hot Dots Human Body for our workboxes this year! I’ve been looking at the Hot Dots but have yet to purchase. 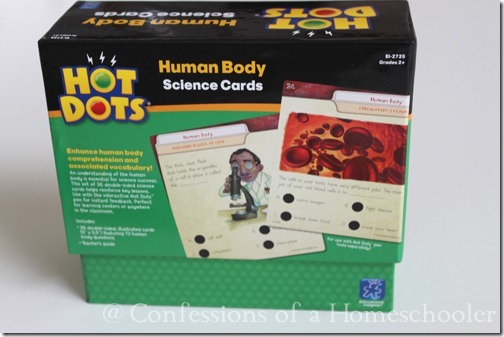 Didn’t realize that they had Human Body cards….our science study for the coming school year. I’ve never heard of hot doors before, but I’m intrigued by the idea. I think my 6 year old would love this! I have”liked” Educational Insights on my Facebook page. Thanks for the introduction. I’d love to win! We have hot dots for my littler guy, but I didn’t even know they had them for older kids. i would love to win this for my kids! I follow Ed. Insights on Pinterest!